Europe's largest solar eclipse since 1999 is set to block out as much as 90 per cent of the sun's light in some areas of the UK. On the 20 March at 9.31am London will lose as much as 84 per cent of its sunlight while parts of Scotland such as Edinburgh will be even darker with 94 per cent of the light blocked out. Astronomers believe the eclipse will begin in London at 8.45am, it'll then reach its maximum eclipse at 9.31am with normal service being resumed at 10.41am. If you want to witness the event the most obvious concerns are also the most dangerous. Do not try and watch the event using the naked eye. Because there are no pain sensors within the eye you won't even know the damage has been done until it's too late. Be safe, use some form of dimming lens. It's likely that they'll be available to buy or obtain closer to the date. As the moon completely covers the sun it'll cast two shadows. The smaller and darkest shadow will occur in the North Atlantic, so if you're hoping to see day turn to night, then you'll need to head as far north as the Faroe Island. The rest of us however will have to make do with the second larger and weaker shadow which will cover the UK and much of Europe. This shadow is caused by a partial solar eclipse where the moon and sun are not directly in line with the Earth. Although less impressive it's still capable of removing over 90 per cent of light. 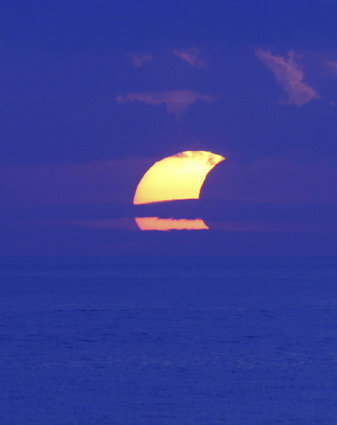 Total solar eclipses are surprisingly rare. The last one in Europe happened in 1999 and the next time you'll see a total eclipse in the UK won't be until 2090. Thankfully there are plenty of partial eclipses between now and then with some potentially being as powerful as this one. The next eclipse will be in 2016 however this is likely to be incredibly small. For the next major eclipse you'll need to wait until 2026 where astronomers believe it'll remove as much of the light as the 20 March event. According to the MailOnline, energy companies have actually issued warnings of blackouts due to their new reliance on solar energy. With 10.5 per cent of renewable energy now coming from solar power, the European grid company lobby ENTSO-E warns that as much as 35,000 megawatts of solar energy could be removed from the grid over a period of two hours. Research by Dr Polly Vizard and Dr Tania Burchardt of the Centre for Analysis of Social Exclusion at LSE broke down data in the Adult Inpatient Survey for 2012-13 to provide a fresh detailed picture of older people’s reported experiences during hospital stays. Caroline Abrahams, Age UK’s Charity Director, said: 'This new in-depth analysis of older people's reported experiences shows just how big the challenge is in ensuring every older person in hospital receives the dignity they deserve and help with eating if they require it. Polly Vizard of the LSE’s Centre For Analysis of Social Exclusion said: 'It’s the first time we have analysed an NHS patient survey in such detail and the findings are very disturbing. What really stands out is not just the large number of patients who say they aren’t always being cared for in a dignified way or helped to eat - but also that there has been remarkably little change in the percentage of individuals reporting inconsistent and poor standards of care over a substantial period time. 'An important message arising from the Francis Inquiry into the tragedy at the Mid-Staffordshire NHS Foundation Trust concerned the need to make “better use” of patient experience data in the future. Looking forward, the new fundamental standards of quality of care introduced following the Francis Inquiry are an important development. In making judgements about the implementation of these standards, there needs to be an emphasis on systematic disaggregation of patient experience data and monitoring the position of “high risk” subgroups such as older people with multiple conditions.